“International Exhibition, Class 4, at Flora’s Fountain. H Breidenbach respectfully invites the attention of visitors to the exhibition to his display of Wood Violet and other Perfumery, 157b New Bond Street, London. Samples for sale at the International Bazaar”. 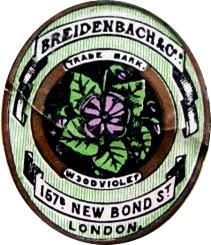 After the death of her husband, my great great grandmother Emily Ann Breidenbach trading as Breidenbach and Co, 157B New Bond Street, Westminster, London; Perfumer registered the Wood Violet as her trade mark on 12 January 1876.